Disfrute de uno de los espectáculos más singulares de luz y sonido en todo el mundo en esta excursión de 3 horas en el Parque Nacional Canyonlands cerca de Moab, Utah. Disfrute de una cena en cazuela de hierro al estilo vaquero en el comedor con vistas al río Colorado. A continuación, dé un tranquilo y lento paseo en barco a medida que 40 000 vatios de luz natural iluminan las paredes del cañón. Observe cómo las luces, las sombras, la música y la narración hacen que las historias sobre la formación, la creación y la historia del cañón cobra vida, tal y como las transmitían los primeros pobladores de la zona. Dinner was filling but nothing of distinction. The boat ride was excellent and our tour guide was knowledgeable and added much to the trip. The light show was okay. Food was wonderful, friendly staff, cruise was amazing, way better than a planitorium because our seats were in a moving boat wonderful experience!! This was a fun adventure worth doing. 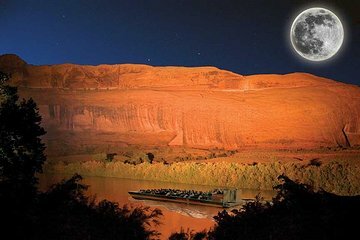 The dinner was very good and the boat cruise was fun and interesting to hear about the history of Moab. The only criticism I have is the seating was very uncomfortable and too close together. This was so amazing and the guide was wonderful and interacted with the people so well. Very well presented. The food was great. Thank you!!! This was a great experience. We had good food, a beautiful cruise, and we really enjoyed Dee's storytelling! The meal before the cruise was fantastic. Some of the best roast beef I've ever had. The hosts were gracious and friendly. The cruise was entertaining and informative. Light show on the rocks was a nice effect to go along with some of the stories and music. All first class from the dinner to the river night cruise. Would highly recommend visiting Moab as a must to do. Awesome people!!! The food was amazing but super crowded. They had it very well organized so it went smooth. The staff was super friendly. I imagenes something completely different. There was a bright light as part of the show against the mountain and the narrative was horribly boring and religious. Not an actual light show. Just an old recorded story. Need to get more modern and drop the religious comments. The food was really good, but I read expecting a little more of a cruise and not as much of a history lesson on Moab. If that's what you're looking for, would definitely recommend, but my kids were a little bored and we spent the last half hour of the cruise looking for shooting star. Great trip. Good discussion, outstanding program. Outstanding food all you want. Very helpful staff if walking is an issue.